A difficult day, so sheer joy to head off to sea for the first time this year in the old and battered boat. 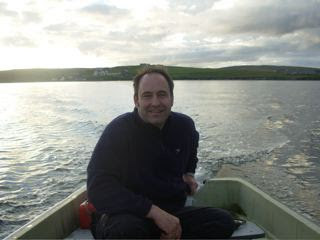 The Yamaha outboard started on the third pull, and then it was off into an absolutely stunning, calm evening. Martha perched in the bow, we headed off on the flood tide and, as an afterhtought, threw a mackerel flee over the side. Success! One mackerel first time, four the next. The sense of satisfaction was overwhelming. Breakfast! Played the new single 'Guitar' again today, and it's a thrilling piece of post-Jehovah's Witnessing Princepop. Perhaps, as Brian texted in to say, not up to the standard of Batdance (check out that EXTRAORDINARY video on YouTube here) but still jammed with all that inimitable sly humour, stunning rhythm guitar, ripsnorting lead, supressed filth and even a bit of daft self-censorship (cutting out the word 'hell' seems a tad....belated). Great email from Lindsay concerning his desire to have the song played at his daughter's wedding (it has the chorus 'I love you baby...just not like I love my guitar') which was greeted with understandable fury by the women in his life. And speaking of guitars, I confess: I have bought another one. It's a Jay Turser JT143 jazz guitar, very like the first guitar I ever played, which was owned by my dad and was an Eko (later sold to one R Ross). Not that I can play anything but a few jazz chords. It's for the planned rockabilly/thrash metal family band currently labouring under the working title Martha and the Mor-Tones, with me, Martha and James. It's a winter project. A lovely guitar, beaurtifully made (in China, like my Lamaq cutaway acoustic and James's astonishing acoustic bass guitar) and truly phenomenal value. Much more reliable and better made than the vintage Hofners and even Gibsons I looked at. Anyway, I hope to pay for the lovely mahogany beast using income from my new monthly column in The Scots Magazine, which is called Still Life and is all about whisky. Where are the free samples, that's what I want to know? Though, in that regard, many thanks to Aberlour and South Africa's Three Ships, I have to say. Have a look at the Nippy Sweeties blog for more spirited and spiritous fun. Back to Lerwick on Saturday, and the Johnsmas Foy continuing to pull in the punters. 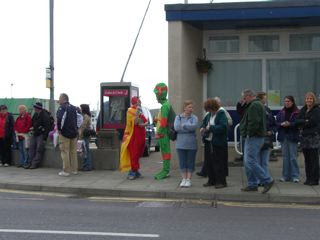 Here we have a scene more familiar from Up Helly Aa, with a couple of guisers, dressed up as...who knows? From what I overheard, they weren't sure either. And then north, north and north again, to the glory that is Fethaland, the abandoned haaf-fishing station at the northernmost tip of North Roe. 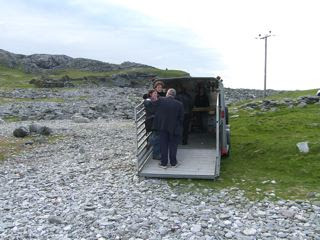 There, local folk had organised a wonderfully remote foy, with music, stunning food (mackerel, scallops, herring, steaks etc, all fresh) and even a bar - that's it in the stock trailer. It was quite, quite magnificent. There was even a Gaelic TV crew, making a documentary about the history of fishing. When I expressed some doubt about the availability of Gaels locally, I was cheerfully informed that two Gaelic speakers had just materialised at Fethaland, which is about as far away from the Gaedhealtacht as you can get and still be in Scotland. Even stranger, the cameraman was Douglas Campbell, who worked on the Voyager film for BBC Scotland which took me to Shetland in the first place, 23 years ago. One of the most atmospheric spots in the known universe is at Fethaland. It's an ancient steatite, or soapstone, quarry, where you can see the ringmarks left from the carving of viking soapstone bowls. And the initials of dozens of fishermen, long-dead, carved during the summers they spent living here in the 19th Century, sailing and rowing their open sixareens 40 miles out to sea. The 1881 disaster, when 58 Shetland fishermen were killed in a single day's storm, saw one Fethaland boat crew of seven lost. It was the beginning of the end for the fishery known as the far haaf. And so to the bar. Possibly the best bar in the whole damn world. There was only one appropriate beer for the location and the occasion. Can you guess what it is? Ah, the red tin, AKA The Shetland Rose...who needs real ale? Or, for that matter, lager? Well, it's midnight plus 30, and that's just about the end of my longest ever day's broadcasting...six programmes (albeit only a few minutes in four of them, longer in Archie Fisher's Travelling Folk and of course the full two hours of the TM Show itself. More pictures tomorrow with a bit of luck. This was taken at 11.00pm at the Radiocroft, just before the first technological failure of the day, as the brand-new, multi-billion electronics of BBC Scotland's Pacific Quay failed abjectly to work. So it was telephone quality for my interview with old pal Ricky Ross, host of the Late Lounge. The show on Victoria Pier went really well, I think - special thanks to the Mark Laurenson Band, Jordan Ogg and Gillian Isbister, my musical guests, and everyone else who helped. But I can't put the day away without mentioning the tragedy that shadowed it. I took my motorbike into Lerwick today because this is one of motorcycling's biggest days in Shetland, with the beginning of the Simmer Dim Rally and the arrival of hundreds of bikers from all over the world. However, 22 year old Mark Leask from Scalloway was killed in the morning, apparently on his way to the rally campsite at Vidlin. 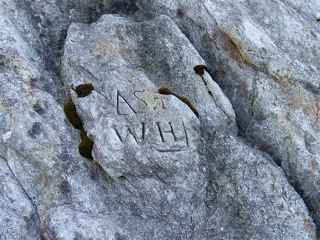 And despite all the music and performance, all of the activity, he and his family were never far from our thoughts. I've just had the excellent New Tradition (featuring a Morton daughter, he said proudly) in the Radiocroft, broadcasting live on the Fred Macaulay Show. Before that I was on Good Morning Scotland, and the day will be a wireless cornucopia of Zetlandic delights: I'm off to Lerwick now, and the Mark Laurenson Band will be playing some tunes live on the Movie Cafe before the live two-hour Tom Morton Show itself, which will be from the Flavour of Shetland marquee on the pier. Mark will play, as will Gillian Isbister and Jordan Ogg. This is all part of the Scotland's Music '07 project, and there will be Shetland music on Travelling Folk (fantastic fiddle player Gemma Donald) with a final conversation around midnight with Ricky Ross on the Late Lounge. Phew! See you tomorrow - hopefully with some pictures. Foster's fourth time lucky tomorrow? Foster Evans, our current Lost in Music champ on the show, has won three days in a row and is now poised to win a personal DVD player tomorrow, if no-one stops him. He's on holiday at North Berwick and it's been interesting getting his daily updates on what the family have been up to (Museum of Flight, paddling, rock pool fishing. Great to have another Stax classic on the show, and indeed another Staple Singers song - Respect Yourself. Wonderful how positive those Staples songs were - secular gospel. I was a wee bit surprised to hear such support for The Police - Bed's Too Big Without You played today and it did sound good, but still, lots of emails full of nostalgia for Outlandos d'Amour etc. Interesting how badly the three members of that band got on, and how bland Sting's subsequent output has been - a circumstance not unconnected. Meanwhile, the motor's on the boat, the anchor has been cleaned and the fishing gear prepared. To sea! But not just yet. Always a risky moment when you ask competition entrants, live on air, what it is they're doing, or what they do for a living. DIY is a favourite, then there's driving, either for pleasure or business, working at home (computers) working at the office (computers and earphones)a surprising number of farmers on tractors, people on building sites, housework, cooking (there's always soup; the TM show is listened to by soup makers, and I'm proud of that. Anyway, good to have a traffic policeman who's game for a go at Word Up and interested in the tales I was telling about the outer islands of Shetland (Unst and Yell, notably) where, because of an amendment to the Road Traffic act by the late Jo Grimond MP, you can drive a car without an MOT and, if you have a provisional licence, unaccompanied by a qualified driver. When I used to hang out in Yell, back in the 80s, it truly was like the Dukes of Hazzard. All sorts of disreputable motors being hammered about the place, everyone with CB radios so they could send the sole policeman on wild goose chases, large amounts of drink being taken, and driven under the influence of. Very little evidence of hotpants, though. ...indeed, I hear hotpants are making something of a comeback this summer. ...or so one entrant to today's Lost in Music competition claimed. Certainly turned my mind to thoughts of a nice Malbec, seeing as the Warehouse Wine Club (free delivery to Shetland)recently left 12 bottles of red at the door. Meanwhile, this Malbec is pretty good! Oh, and the boat is finally in the water. Fish, beware! ....despite even worse treatment at the hands of Servisair - but not as bad as those poor folk who were on the direct flight from points sooth...they circled Shetland, went back to Aberdeen, and were unceremoniously dumped off the aircraft and told to be back next day at 12.30 pm. No offer of accommodation, taxi fares or anything. Fortunately, there were some eminent members of the Zetlandic community around and promising to make some official waves. Finally (after being treated once again with withering contempt by British Airways) we left Aberdeen at 1.00pm (no cabin service on the flight)and reached Sumburgh about 2.00pm. Only on reading the Shetland Times did I discover that Servisair have taken over ground services for Loganair from BA, BUT, you still book through BA DESPITE the fact that you cannot check-in on line or even, get this, buy tickets at the airport. Shetland travellers are being treated like scum by Loganair. It's time for (a) a complete boycott and (b) an invitation to Stelios or Mr Ryanair to take them on. No flights into Sumburgh due to fog. I went to the airport because the 6.30pm flight was still showing an estimated time of departure, and there met the contemptuous (and contemptible)shambles that is Loganair's ground arrangements: British Airways handle the boarding (unless anything goes wrong) in which case (like today) you're pointed in the direction of Servisair. As if this was some cheapskate charter instead of a lifeline scheduled service. A woman took a handwritten note of my name and said to come back tomorrow for a 12.30pm flight. That, she claimed, would definitely go. Definitely. No offers of accommodation, taxis or the boat, which ( I checked) had no cabins but was still boarding foot passengers. Always wanted to try the Carmelite ('Boutique') Hotel, the old Grampian down on the Green in Aberdeen. Decent weekend rate, so I booked it and got the bus back into the city. The old Grampian has had a coat of paint and a tarted up sub-Malmaison bar and restaurant. Welcoming, and good staff, though. AND IT HAS FREE BROADBAND! At last! As opposed to the utterly disgraceful £15 a day charge for wifi at the Holiday Inn Express. A good reason never to stay there again. Just time to buy an in-room picnic from M&S. I'm in one of the cheap rooms (as opposed to the uh, £250 a night suites) and while the bathroom's been tidied up, and there's been some decor tidying, the bed, curtains and dreadful TV are from the old Grampian. Oh well. I doubt, personally, if the 12.30 plane will go tomorrow. In which case, it'll have to be the boat. Aberdeen and the Great Simmer Dim Broadcast! Thanks to everyone who's been in touch about Lucy (see post below. All your thoughts are really appreciated. Poor old Lulu doesn't know what's going on - her lifetime playmate has disappeared and she keeps trying to persuade anyone or anything she meets to have a bit of rough and tumble high jinks. 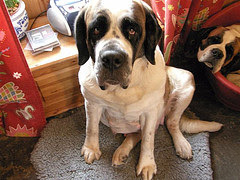 With a very robust and active St Bernard this can be a bit...intimidating. Back in Aberdeen after a four and a half hour drive from Kelso last night - well done to producers Jenny and Dawn for everything involving Soundtown. 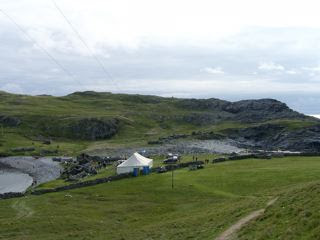 Our next outside broadcast will be, in fact, from Shetland, on 21st June, midsummer, when I will be hosting the entire day of BBC Radio Scotland's broadcasting from the midst of the 'simmer dim'. There will be live music from a host of Shetland acts, input to GMS, Fred Macaulay, the Radio Cafe, Travelling folk and Ricky Ross's Late Lounge, and a special live Tom Morton Show from the Victoria Pier in Lerwick, featuring music from a host of stars. 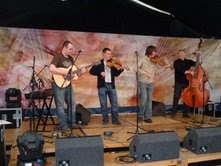 This will all coincide with annual Johnsmas Fair in Shetland, so it should be brilliant! I write from the library in Kelso, where I note they charge fines for overdue books! Ah, the tiny benefits of living in oil-rich Shetland. Computer use is, however, free, and everyone's very friendly. I'm here to do the show from Kelso High School (great deco main building)as part of BBC Radio Scotland's Soundtown initiative. I've made my escape from the studio for a wee while because our guest band, a kind of Metallica/Incubus-influenced pupil outfit, is rehearsing at ferocious levels and my continuing state of ill-health can't cope. I'm not as young as I used to be. Efforts by the engineers to get them to turn things down seem to be succeeding, but Belle and Sebastian they ain't. Anyway the bronchitis and asthma is responding to treatment and my speaking voice is becoming more Tom Waits than Darth Vader. I've never been to Kelso. In some ways it's like stepping back in time - it's a big old town with lots of proper old-fashioned shops, rather tweedy and John Buchan-esque on first glance. Though I did have an excellent capuccino in a very plush and modern cafe called Boo. And a pure 1970s bistro experience at a place called Oscar's last night. In a good way. Deep fried stuffed mushrooms and home made chips - you cannae whack it! Actually, I'm getting a bit peckish now - but I have to save myself as the Home Economics Department is due to ply the team with goodies in a wee while. Cream cakes agogo! Pat Nevin, a huge music fan, is coming down from Peebles to guest on the show...and we'll try not to talk about football. which in my case won't be hard, as I don't know anything about it. Who were Scotland playing last night? Took poor old Lucy on her final journey to the vet yesterday. She was diagnosed with cancer about six weeks ago and has been on a course of steroids since. Her breathing, though, has grown more and more difficult and by yesterday she could barely stand. Many, many thanks to Juliet, Jim and everyone at the Bixter surgery for being so kind and caring. Her sister Lulu is in a state of high agitation. We're all very sad. ...He may, under a more politically correct pseudonym, be lurking HERE. I think this is a bit steadier than my last (first) attempt at video blogging...shot on a wee still digital camera, this is The Radiocroft in Hillswick, spiritual (and for the most part, physical) home of the Tom Morton Show. It's a croft called Gateside, about two miles from my house, and last summer we ran it as a second-hand bookshop called The Bookcroft, with the radio studio housed in the stairheid cupboard. Now the office, recording and radio studio stuff has taken over the whole house, leaving us two spare bedrooms for guests. 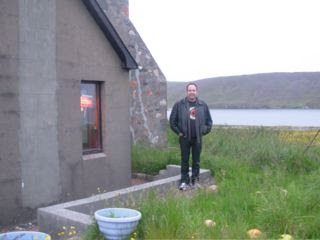 The house is on a working croft, with sheep at the moment. There used to be pigs and hens, but no longer. It's all very simple, really. There's an ISDN digital connection thanks to British Telecom, something that used to be called Home Highway but is now almost entirely redundant except for broadcasting purposes, due to the advent of Broadband. There's a mixer and several microphones, and we can do live music, within reasonable limits. It is, I am fairly certain, the BBC's most remote outpost within the UK.